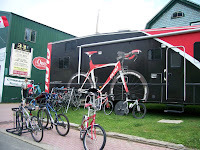 Ironman Lake Placid will start tomorrow morning at 6:45 a.m. from Mirror Lake in the Village of Lake Placid. Some roads will be closed and it will be difficult to get around if you are driving around Lake Placid. It would be useful to check out this schedule and alternate driving instructions should you like to see any of the event or drive though the area. Tomorrow, you can track your favorite athlete here at this great link to live race coverage. I'll be at the bottom of our driveway tomorrow, cheering on the cyclists as they head out of Lake Placid and down the big hill through the Cascades. Keep your fingers crossed for no rain!! Play Time in the Adirondack Park!